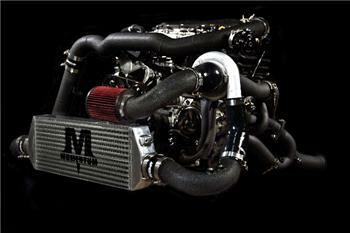 Momentum Performance Tuner Turbo Kit - Dezod Motorsports Inc - Home of the automotive performance enthusiast since 2002. The Momentum Performance Nissan 350Z Tuner Kit has been put together with the express intent of helping street tuners and track junkies “Push Forward” and achieve their performance goals. The kit offers a fully scalable turbo solution but provides just the basics (no MAF, fuel injections, fuel pump or software), allowing owners to select their own custom tuning solution and fuel delivery system. This makes the Tuner Kit ideal for owners seeking a solid foundation on which to build their own personalized performance solution, and sets it apart from the full Momentum Performance Turbo Kit. The Momentum Performance Tuner Kit is capable of producing between 400 WHP (stock motor) and 600 WHP (fully built motor). Two years and 25,000 miles of on-track testing have helped Momentum to develop on of the most durable and highest performing turbo kits on the market, an important component of the Tuner Kit.